November 25, 2015 – Certified sommelier Leslee here again! Decorating for the holidays is one of my favorite things to do, especially when it comes to entertaining guests for holiday parties. While the thought of cleaning the house, readying your menu and selecting just the right wines can seem a bit overwhelming, I’m here to share a few easy tips that I use in my home to make entertaining a snap! HOLIDAY ENTERTAINING TIP: Pick recipes you can either make ahead of time or are easy to do just an hour or so before guests arrive. Check out this Blue Cheese and Walnut Mousse holiday recipe—just 20 minutes of total preparation time and voilà! 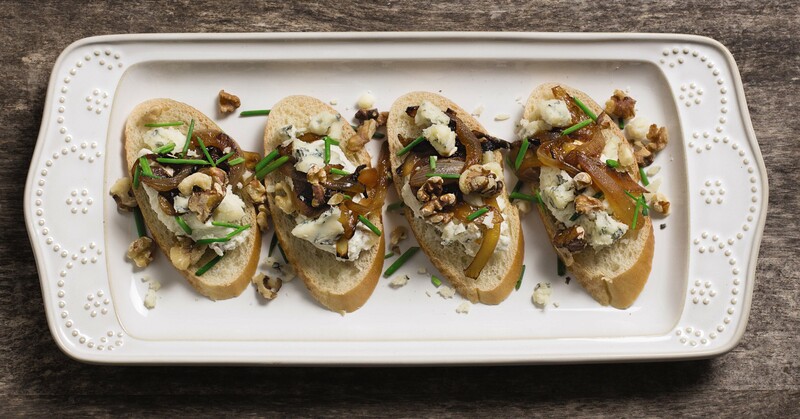 An easy, and eye appealing snack that most will love. HOLIDAY ENTERTAINING TIP: Remember, not all of your platters, or wine glasses, have to match! ‘Shabby Chic’ is the new trend for plating, housewares and entertaining tablescapes. Head to an antique or thrift store for some real gems! Florals, prints, and stripes all paired to a wide variety of solid colored fabrics can really make a holiday table look super swanky. 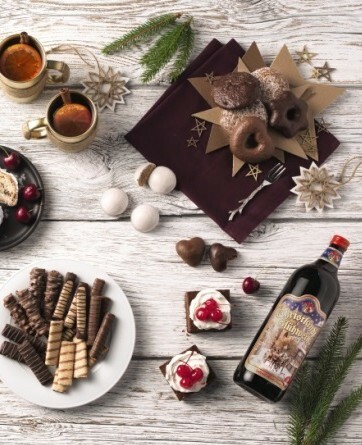 If you plan to serve a cool holiday drink like this Chocolate Raspberry Champagne Cocktail or some great ALDI wine, use a variety of old-fashioned wine glasses. HOLIDAY ENTERTAINING TIP: Clip bits of pine or spruce into your ice cube trays before the water freezes. When chilling wine, toss a few of these ice cubes over the top of your ice bucket. It will make your wine tub look extra ‘holiday-like’! HOLIDAY ENTERTAINING TIP: Create food & wine pairing stations around your home, allowing guests to nibble & sip at their leisure. Pair each wine with each dish, dessert or appetizer all at separate stations to make your party engaging and entertaining. Follow our Facebook WinesDay series for some easy pairings/tips when it comes to cheese/wine or chocolate/wine pairing stations. Or, check out my Wine Pairings for your Holiday Meal blog post for some great ideas as to wines & foods, paired just right. Last, but certainly not least…don’t stress! ALDI makes it super easy to get it all in one place. From their holiday recipe series online, to their affordable and delicious wine selections – I love shopping for it all in one spot at ALDI! Happy holidays! Leslee Miller is a dually certified Sommelier through the International Sommelier Guild and the Court of Master Sommeliers. 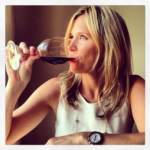 She is the sole owner of wine consulting firm, Amusée, based in Minneapolis, Minnesota.